By Todd YoungbloodApril 12, 2019Customer Service, Think! This week’s episode has a business spin to it. Even if you’re not a business-person though, you’ll be able to relate. AND… It just might help you get better customer service for yourself. If you are in business, listen up! Every single one of us can tell multiple stories about a truly awful customer service experience. How can bad customer service be so rampant? It’s literally a $350 Billion industry. With that much money up for grabs, how can this be? I’ll illustrate each with a story. For the first, thanks, General Motors. I bought a new GMC Yukon last August. I LOVE the vehicle! And, my buying experience last summer was outstanding. Genuine interest in understanding what sort of vehicle I had in mind. No high pressure. No fuss. No muss. No bother. Then last week I took it back in for an oil change. The drop-off process in the sparkling clean, well-organized service bay took less than 3 minutes. I then hopped in an Uber to grab lunch with a couple of colleagues. About an hour later I got a phone call. My service technician told me they were all finished up, and that he recommended I have them change the front and rear wiper blades before pick-up. I’ll spare you the details, because he did eventually appear to understand that I only want to buy the parts and services that are actually required to solve a problem that actually exists, as opposed to what his GM-provided script told him to sell. Mindlessly following a process designed by some nameless, faceless corporate drone transformed what was a pretty darned good customer service experience into one that caused me to rant and rave and dump on GM. Stop mindlessly follow a process! It’s late May, 2014 in Le Haye-Pesnel in Normandy France. Now Le Haye-Pesnel is not what you’d call a great center of …well… anything. It’s a tiny town with some 1,300 inhabitants about 60 miles south and a bit west of Omaha Beach, site of part of the D-Day landings. 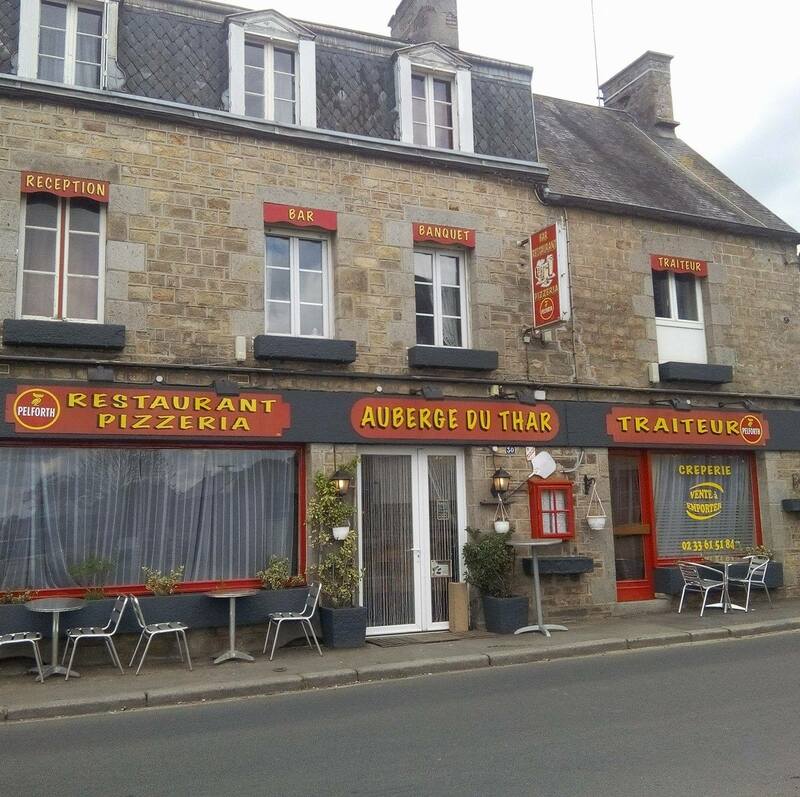 I’ll remember the place because of L’Auberge du Thar, a pizzeria and scene of the coolest example of great customer service I’ve ever experienced. I was on my annual bicycle trip with 36 folks crazy enough to think pedaling a bike all day is really a great way to relax! I was in the first of two groups to roll into town for a lunch break. Problem was, the town was closed. I’m serious! The whole town. Was closed. Not a soul was in sight, and all the shops and houses appeared to be buttoned up tight. Then one in my group spotted three people in L’Auberge du Thar lounging around a table sleepily chatting. He also informed us of the clearly visible draft beer taps. That was all we needed to get over our reluctance to bang on the window and disturb the occupants. None of us could speak much French, none of the three folks inside could speak much English, and although it was just 5 years ago, Google Translate did not yet exist. In any case, the immediate, upbeat, welcoming vibe was unmistakable. We stumbled well enough through the nine-item menu and figured out our options. That’s when the pointing, pantomiming and loud, slow pronunciation of French and English words ensued. We finally figured out that we actually only had a choice between a jambone et fromage sandwich or a jambone et fromage sandwich. (That would be ham and cheese, by the way.) We all agreed that was fine, especially given that Henri the bartender was already passing around cold beers. At this instant, Emily the waitress bolted out the door and turned left while Francois the last of the trio bolted out the door and turned right. Within minutes – with nobody even close to needing a 2nd drink – Emily zips back in with an armful of baguettes from the bakery down the street (which was closed) and Francois follows with a bagful of jambone et fromage from who knows where. We all got an excellent lunch in record time, and Rose, who really wanted “tomate,” got her sandwich with sliced tomato. And all with a flourish. And all with a smile. And all with a truly genuine “welcome to Normandy we’re glad you’re here and sure hope you’re cool with ham and cheese ’cause that’s all we got” attitude. It was extraordinary! And when you think about it, it really didn’t take that much effort on their part. They just pulled the whole thing off with a focus on making us happy. Then the second half of our bike group arrived and we got to watch the same awesome performance again! A simple focus on part two of great customer service, “Solve the problem,” provided me with an experience I’ll genuinely love to talk about the rest of my life. I’m your Intentionally Vicarious host Todd Youngblood – Still a little miffed at General Motors and wondering what other unnecessary repairs they’ll recommend I buy in the future because they mindlessly follow a process designed by some pencil-neck corporate geek – Thinking again I’d love to return to L’Auberge du Thar for yet another cold beer with a jambone et fromage sandwich – And still having more fun than anyone else I know.